Highland Wagyu » Blog Archive » Austrians get their Wagyu on! Austrians get their Wagyu on! Two Aberdeen Angus breeders and the only pedigree Shorthorn breeder in Austria, Peter Schuhmacher (second from right) of Freehill Shorthorns, visited Highland Wagyu this week. And they got their Wagyu on – literally with our branded hats! 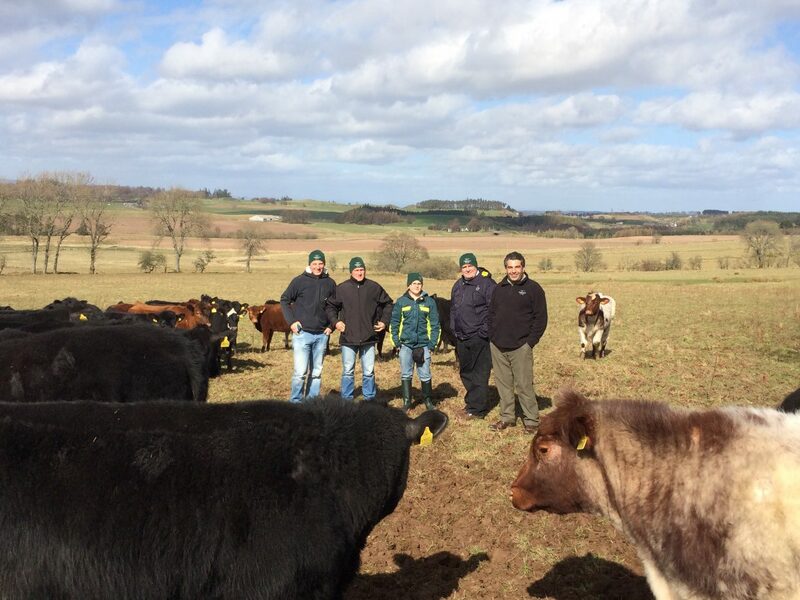 We spent the day touring the entire Blackford estate, looking at all our breeds of cattle while Oliver Behringer of Behringer Carinthia Aberdeen Angus (pictured second from left) translated with Peter’s nephew. We’d been on their radar for a while due to recent purchases we’ve made of both Angus and Shorthorn cattle. While they had seen Wagyu in Europe before, once they’d seen our Wags, which seemed “different”, their opinion completely changed. And the group seemed overwhelmed by the weaned heifers – a mix of all our young females from all our breeds – they saw at the end of the tour. Oliver said it was he best visit he’d ever had and all four agreed it was fascinating. For us, it was a pleasure hosting people with such a keen interest in what we do.